What draws me to pomegranate, might be its vibrant red, perhaps its healthy benefits to our body. Comparatively, pomegranate contains much more antioxidants than many other kinds of fruits. Some people might be put off from its acidity and astringency. But for me, I just like its unique flavour. I can’t explain how and why I fell in love with this fruit during my first encounter. Not only does its juice taste great, especially in cocktails and mixed drinks, but also it can be a wonderful ingredient of making desserts. Take this soufflé as an example, the tangy taste of the pomegranate provided a perfect balance to this elegant dessert, which ended our dinner perfectly the other day. This soufflé was baked with Royal Pom’s complimentary pack of two giant pomegranates that I’ve ever seen that big. They were very nice, perfectly grown, and juicy. Only one pomegranate was far enough to make juice for two large soufflé cups. I was very satisfied with the taste and texture, as well as amazed by its colourful looking. But I don’t quite understand why the soufflés turned into light purple in colour, instead of light red. Anyone has any idea? Fresh juice from one giant pomegranate. Coat a ramekin with butter and sugar. Mix the cornflour with a dash of water, just enough to make a smooth paste. Set aside. 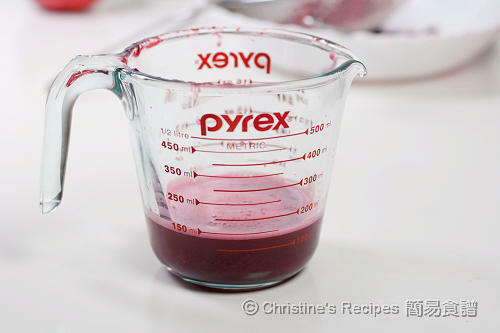 Place the pomegranate juice and sugar in a saucepan, over medium heat and cook until the sugar is dissolved completely. When it almost boils, reduce the heat to low, whisk in the cornflour paste, a little at a time. Continue to cook for about 1 minute, stirring constantly to avoid from forming any lumps in the mixture. Make sure not to allow mixture to boil again. Remove from the heat. Let cool completely. Place the egg whites in a large clean bowl. (Note: Make sure there’s no oil or water in the bowl at all.) Use an electric mixer to beat the egg whites until many bubbles form. Add the sugar, a little at a time, beat at high speed until stiff peaks form. (Please refer to this video: How To Beat Egg Whites.) Make sure not to over beat the egg whites, lest they will break down. Transfer pomegranate mixture into a large mixing bowl. Add a little bit of egg whites and stir in to loosen the consistency. Gently fold-in the remaining egg whites. 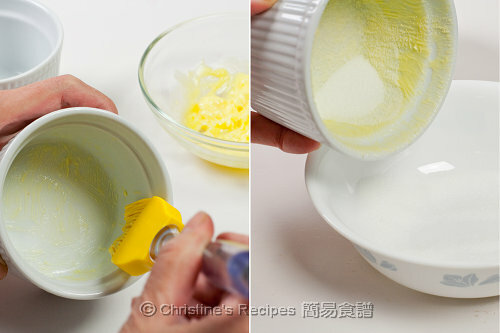 (Please refer to this post with video: How To Fold-in Egg Whites). Brush the ramekins with the softened butter. Do use upward strokes to brush the sides. It helps the soufflés rise properly. Chill in the refrigerator until set. Repeat this step. Sprinkle in a bit of the caster sugar, turning the ramekins to coat evenly the base and sides. Set aside. Spoon the mixture into buttered, sugared moulds. Scrape the mixture off the top with a palette knife in order to have a smooth surface. Make sure not to get any mixture on the side of the ramekins until the moulds are full. Clean the rim and sides if any. Bake it the preheated oven for about 13 to 14 minutes, or until golden brown and risen 2cm above the rim. Serve immediately dusted with icing sugar. The intensity of sweetness of every pomegranate is different. Adjust the amount of sugar to taste accordingly. You might replace the fresh pomegranate juice with bottled ones. Or substitute with strawberry juice. These look perfect, Christine. Absolutely adore the pretty purplish pink colour! Wow this pomegranate dessert looks great. I love using pomegranate seeds or juice in a variety of recipes. They are one of the healthiest fruits to eat! I just shared this week a recipe for Jamba Juice's Pomegranate Paradise smoothie! These are just beautiful! What a great use of pomegranates. I have been waiting for this post and what a beautiful souffle you have made. 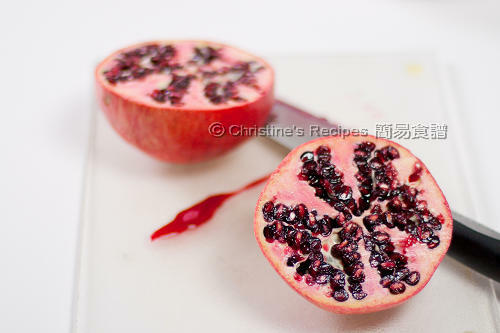 I love pomergranate and its health benefit is great! That's one really beautifully risen souffle and I love the natural colouring from the poms. Wow this looks beautiful and yummy. 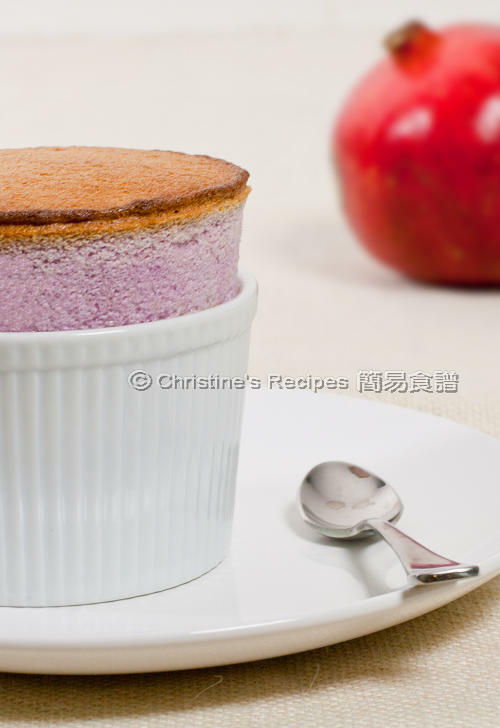 I have never tried Souffle before but feel Souffle not so easy to make? What a souffle!! Will definitely try making it. Thanks for sharing this recipe. 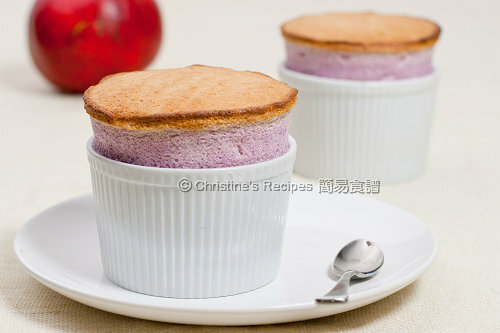 Christine, your souffle looks perfect! :) I have yet to try making souffle, thanks for the inspiration! It is perfect! Perfectly risen to any occasion. Awesome. 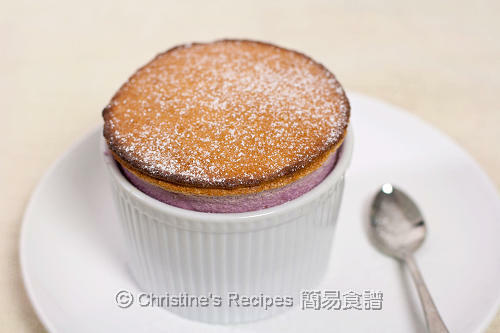 Interesting purplish color this souffle has taken from the pom juice, I wonder why is it not more reddish or pink. I like your recipe yield, makes it easy for me to cook for two! Wow you really got such beautifully risen souffles -- great job! Never heard of a pomegranate one, but I bet it's divine. wow!! I love the look of your souffle! Ehhhh... your souffle so beautiful!!! Mine was cracked on the top though it rose up high... I must bookmark and study your recipe!! That is one beautiful souffle. Mine one always tend to just collapse for some reason. i had started my first baking yesterday after reading and inspired by your blog. But my cupcakes' top are sticky? can you help? This is a beautiful creation! I have never had pomegranate other than in salads or in drink or in savory dishes; what a terrific idea for a change! Very elegant. What kind of cupcake did you bake actually? Which recipe? Did you test it if it's cooked through? hong kong cupcake..yes, the toothpick came out clean. Purple is still a nice colour =) looks perfect! Great! It really looks good and tasty i think this will be perfect for those who loves sweets. Thanks for posting.